Singapore Airlines Ltd. found "premature blade deterioration" during routine inspections of some plane engines, leading the carrier to ground two Boeing Co. 787-10 aircraft in a widening turbine problem for Rolls-Royce Holdings Plc. The carrier, in consultation with the engine-maker, identified other Trent 1000 TEN engines in its 787 fleet to undergo precautionary inspections, Singapore Airlines said in a statement Tuesday. All these inspections have been concluded, and a remaining check will be completed on a 787-9 aircraft of its Scoot budget carrier by Wednesday. The new fan issue exacerbates a problem that has beset the Rolls-Royce engine, one of two turbine choices on the 787, since at least 2016. Blade wear has prompted previous groundings of the wide-body planes - Boeing's most advanced model - for early repairs. It comes at an inopportune time for Boeing, which faces a global grounding of its best-selling 737 Max after two crashes raised safety concerns with regulators. Rolls-Royce said in a statement it will work with affected customers to accelerate an implementation of enhanced replacement blades and "to ensure that we can deliver on our Trent 1000 TEN future commitments." Singapore Air said it's working closely with Rolls-Royce and authorities for any additional actions and precautionary measures that may be required. Shares of Rolls-Royce fell as much as 2.7 percent, and were down 0.5 percent to 912.4 pence at 8:37 a.m. in London. 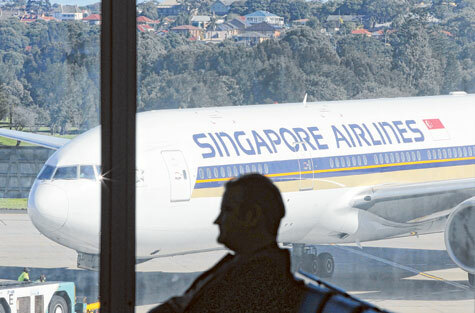 Singapore Air rose 0.6 percent to S$9.78 as of 3:35 p.m. in the city-state. A discovery of faster-than-expected blade deterioration affected about 120 Trent 1000 turbines, or about 8 percent of the global fleet, a person familiar with the matter said in September. That was a further setback to Rolls-Royce's efforts to reduce the number of idled planes after flaws in the engine design led the company to record more than $1 billion in charges. Design glitches have plagued the Trent program for two years and eaten into Rolls-Royce's share of engines for 787 jets, known as Dreamliners, against rival General Electric Co. The intermediate pressure turbine blades - which had already been flagged for replacement - aren't lasting long enough to meet the previously set maintenance schedule. Customers of Dreamliners include Japan's ANA Holdings Inc., Air New Zealand Ltd., British Airways, Virgin Atlantic Airways Ltd. and Norwegian Air Shuttle ASA.